From an egoyomi for the year 1786 On this cheerful calendar illustration (egoyomi) the numbers for the short months are hidden in the subdued pattern of the big boy’s kimono. The fact that the print is related to the year of the horse (1786) can be recognized in the drawing on the lantern. Like most small-format egoyomi, this one is not signed. It is possibly by the young Hokusai, but at any rate the spirited print is charming on its own account. The numbers fort he short months are concealed in the pattern on the boy’s kimono in this charming calendar print. That 1786 was the year of the horse is indicated by the drawing on the lantern. 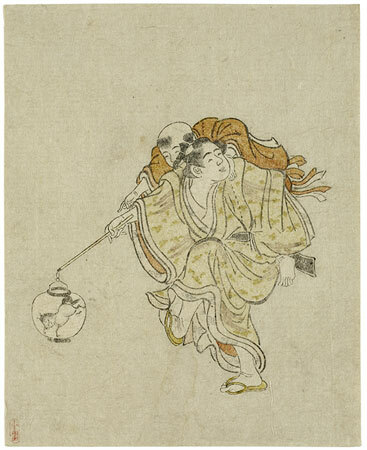 Like most small calendar prints, this is unsigned, and although it would be tempting to see in it the panache of an early work, say by Hokusai, it is delightful enough on its own merits to forgo the need of an attribution. Reproduced in: Cent estampes japonaises, Galérie Janette Ostier, 1965, no. 64c.